Tuesday, August 18 1908 -- Another six days passes in the Examiner without a major Herriman cartoon, then this effort signals his return as a regular. The L.A. Republican convention happens today, and the few remaining Lincoln-Roosevelters have been seated all the way at the back of the hall, after their candidates were mostly routed by corporate machine picks, led by machine boss Parker. Connie, March 14 1937, courtesy of Cole Johnson. Connie, daring young modern girl....and the Cosmic Accumulator - wonderful!! Now, I will have to go back and read all of your Friday entries.... the drawings are great. A bit like Harrison Fisher or Howard Chandler Christy....turn of the century stuff - very nice. I have already started into your archived blogs - thru 2005's. Clarence David Russell was born in Buffalo, New York on August 19, 1896, according to his World War I and II draft cards. The same birthdate was recorded in U.S. Veterans Gravesites, ca.1775-2006 at Ancestry.com. In the 1900 U.S. Federal Census, he was the first of two children born to Hamilton and Elizabeth. They lived in Buffalo at 43 East Balcom Street. His father was a bookkeeper. In the next census, the Russells remained in Buffalo, but at 143 North Pearl. Russell’s father was a claims agent. Their address was the same in the 1915 New York State Census. The Buffalo Evening News, June 24, 1915, said Russell graduated from Lafayette High School that evening. According to Russell’s obituary in the New York Times, October 25, 1963, he studied at the Chicago Art Institute. The Western Electric News published one of his cartoons in its August 1918 issue. The Buffalo Courier-Express, October 23, 1918, noted Russell’s achievement as a cartoonist. 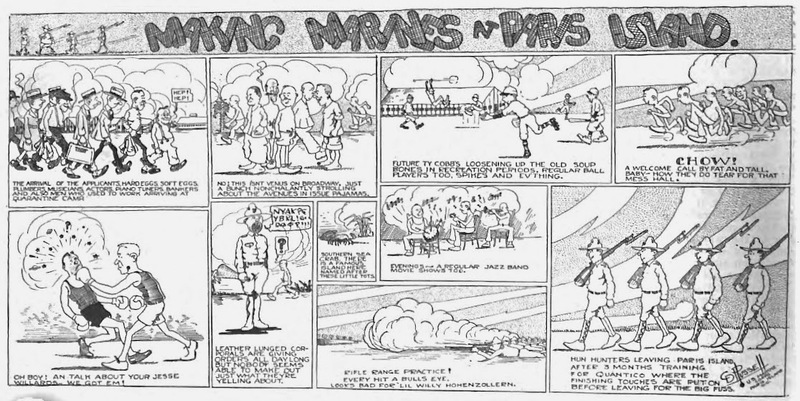 Buffalo Boy’s Cartoons Make Hit with MarinesCorporal Clarence D. Russell, 143 North Pearl street, is making a reputation for himself as a cartoonist in the Marine corps. 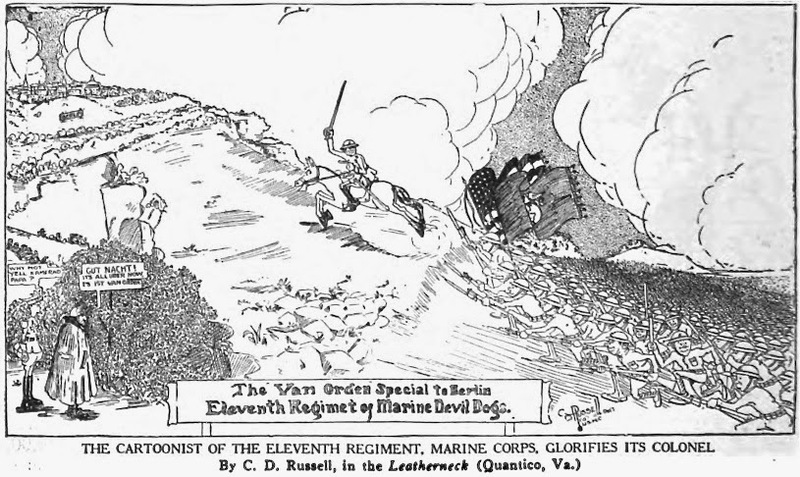 He enlisted in this branch of the service last May and after a short period of training at Paris Island, was sent to the camp at Quantico where he soon be came associated with the Marines’ newspaper, The Leatherneck. “Russell will be part of the outfit which will compile a daily history of the regiment under the supervision of Colonel Van Ordence and Captain John H. Craige, intelligence officer,” says The Leatherneck in a recent issue. Russell is a graduate of the Lafayette high school with the class of 1915. 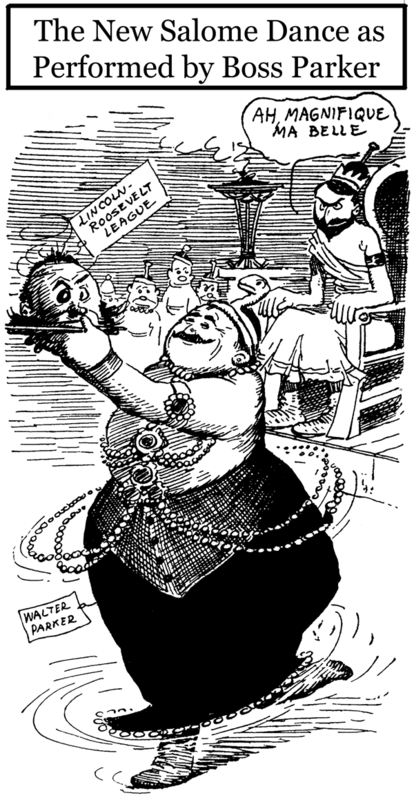 The American Review of Reviews, November 1918, reprinted one of his Leatherneck cartoons. Word has been received by Mr. and Mrs. Hamilton Russell of the safe arrival of their son, Corporal Clarence D. Russell, who embarked will the Intelligence Staff of the 11th regiment, U.S.M.C. The New York, Abstracts of World War I Military Service, 1917-1919, at Ancestry.com, said Russell was stationed in France from October 26, 1819 to July 29, 1919. He was discharged on August 11, 1919. Mrs. [sic] Oliver M. Russell left yesterday for New York where she will join her mother, Mrs. Hamilton Russell who has been there for a fortnight visiting her son, Clarence D. Russell. The New York, New York, Marriage Indexes at Ancestry.com said Russell married Ruthelma Stevens on April 27, 1925. She was an actress. According to the 1925 New York state Census, they resided at 15 Sheridan Square in New York City. Their marriage ended in divorce and both remarried. Advertising Arts & Crafts (1926) said Russell’s studio was located in New York City at 195 Broadway, Room 1202. 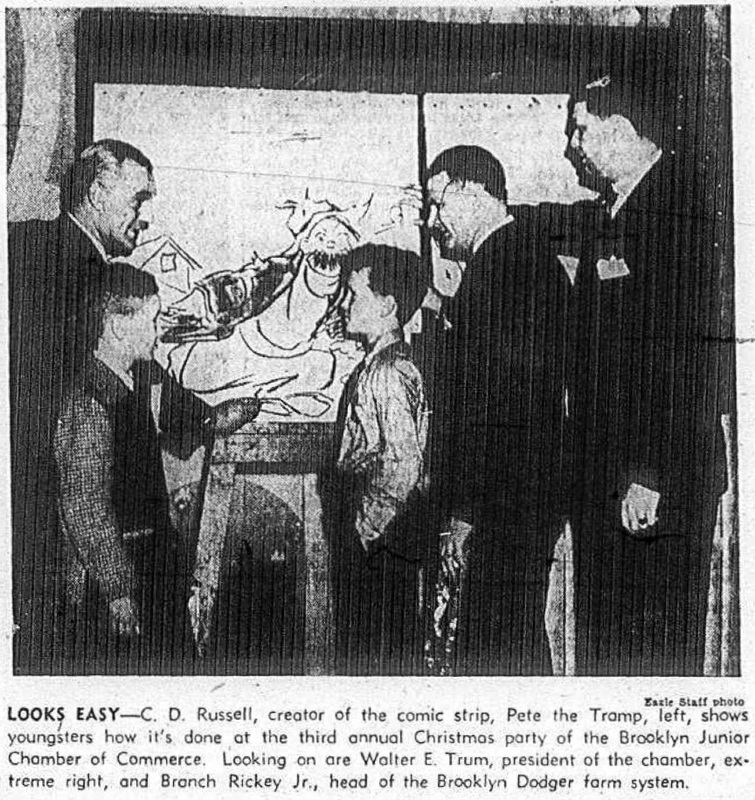 According to American Newspaper Comics (2012), Russell’s strip Pete the Tramp, began on January 10, 1932. Snorky was one of three toppers he used on Pete the Tramp. 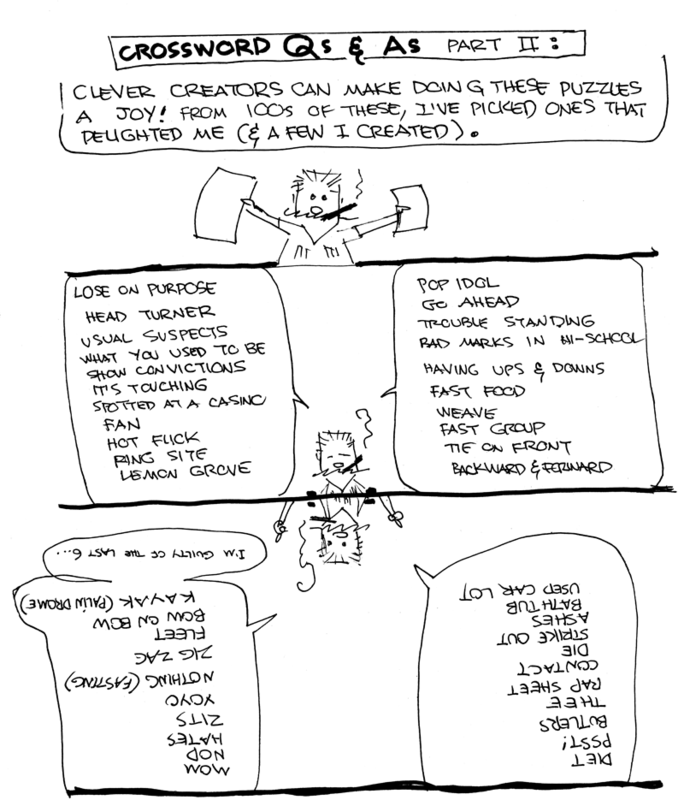 I suppose they don’t really, but comic artists give me the impression that they lead cheerful, irresponsible lives. C. D. Russell, who inks out a handsome living drawing scape-grace dogs and tramps, conducts a household at Brewster, a suburb, which is overrun with dogs. Russell has six at the moment, collies and pointers of excessively friendly and roistering dispositions. Oddly enough, he has no small Sealyham such as his cartoon character. Putnam County Courier (Carmel, New York), February 10, 1933, noted Russell’s whereabouts. Mr. and Mrs. C. D. Russell, have rented the home of Dr. and Mrs. Jewitt in Kent, “Stonywold.” Mr. and Mrs. Russell have lived here for about one year, coming from New York city. Mr. Russell is a “cartoonist” in the Daily Mirror. A 1937 issue of the Judge printed instructions for Russell’s word game. Before the paper and pencils are put back in the desk drawer, a neat game for groups of two, three or four is “Letter-Go,” an invention of cartoonist C.D. Russell, who is also the inventor of Pete the Tramp. Each player rules off, free-hand, a box containing twenty- five squares. This is done by making six horizontal lines about a half inch apart and crossing them with six more half inch apart vertical lines. The players then take turns in calling out letters. Each letter, as it is called, must be placed by each player in any one of his twenty-five squares, and no erasing either. The object is to make words horizontally and vertically. When all the squares have been filled in, papers are exchanged and scores totaled. A five-letter word counts 10, a four-letter word 5 and a three-letter word 2. Two-letter words don't count at all. Neither do proper names nor foreign words. Also, adding an “s” on the end of a singular word to make it into a plural is just a waste of time. Your opponents will only allow you the singular. A perfect score is 100 — five five-letter words each way. But in stiff competition you should be able to pick up the marbles with anything in the neighborhood of 70. Russell has not yet been found in the 1940 census. Russell signed his World War II draft card on April 27, 1942. He lived in Atlantic City, New Jersey, and was a cartoonist for King Features. His description was 5 feet 8 inches and 165 pounds, with blue eyes and gray hair. 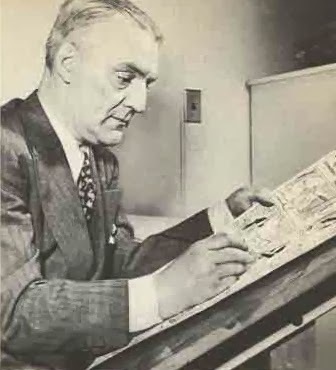 Russell was involved in the founding of the National Cartoonist Society in 1946. When the Buffalo Courier, December 31, 1962, noted the death of Russell’s sister, he was living in Fort Lee, New Jersey. Russell passed away October 22, 1963, according to the New York Times: “…[Russell] died of cancer Tuesday [October 22] in Kingsbridge Veterans Hospital, the Bronx. He was 67 years old and lived in Fort Lee, N.J.” However the date on his headstone is October 23. He was buried at Long Island National Cemetery in Farmingdale, New York. Pete the Tramp ended December 12, 1963. A list of his comic book credits is at the Grand Comics Database. Going through some old Jim Ivey files, I encountered a folder of Japanese comics and editorial cartoons. Lurking in the folder I found this lovely and beguiling print. It is printed on tissue-thin paper (rice paper? 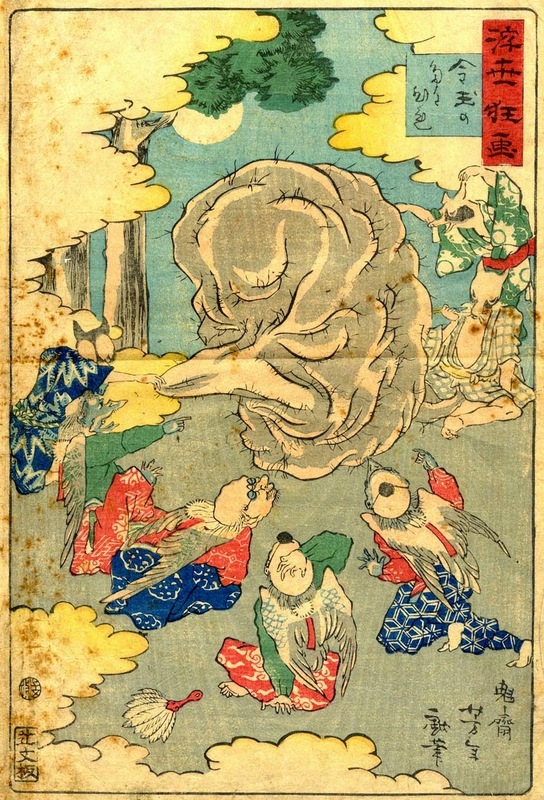 ), and it has the luminous colors that I associate with woodblock prints, though I see no evidence of woodblock lines. As you can see it's not exactly in mint condition -- pretty badly foxed on one end, dirty, and seems to have some age to it (minimum 60 years old, but I suspect quite a bit older). There is some pretty odd imagery here, especially the giant grey hairy broccoli floret in the middle. Not to mention old guys with wings, a monster, and a couple of wolfmen. I realize this is somewhat off-topic to the blog, but this thing is intriguing. I'm assuming it is comics of some sort. Can anyone tell me something about it? (Jim's memory of it is hazy -- his vague recollection was that there was a big book of these pages, and they did form some sort of continuity). While I can't tell you what it is or where it's from, I did see some evidence (I think) that it's a woodblock print. Looking closely at the lower grey area and the upper blue area, is that wood grain from the block that I see? It sure looks like it to me. It sure is an interesting piece. Interesting observation! Those gradations you're referring to are not nearly as noticeable on the actual print. But you sure are right, in the scan they do give the impression of woodgrain. Neat! I asked for a translation in reddit for this print and a very solicitous person answered. It seems that it is an ukiyo-e from the series "Comic Pictures of the Floating World" by the artist Tsukioka Yoshitoshi. I guess further information may be asked at the site http://www.yoshitoshi.net/. Since it seems that they don't have a scan for this specific print, I'd be great if you send scans of it to them. Thank you very much, zhamison, for your research on this subject! Wonderful to know what it is. I have emailed the yoshitoshi folks the image and asked for some details on the series from which it comes. Naturally Jim must have been attracted to this by 'comic pictures' being in the title! If I learn more, I'll post it here. Frederick Thompson “Fred” Richards was born in Philadelphia, Pennsylvania, on May 27, 1864, according to Who’s Who in New York City and State (1905). In the 1870 U.S. Federal Census, he was the second of three children born to David and Janet They resided in Philadelphia. The 1880 census recorded the Richards family in Philadelphia at 1708 North Eighteenth Street. His father was involved in wholesale dry goods. According to Who’s Who, Richards was a pupil of the Pennsylvania Academy of Fine Arts, and studied with Thomas Eakins and Edmund B. Bensell. The 1885 Philadelphia City Directory listed him as an artist at 524 Walnut, and his residence at 1626 Jefferson; the same information was found in the 1886, 1889 and 1890 directories. Who’s Who said he married Odile A.S. Hudry on October 21, 1890, in Philadelphia. At some point they moved to New York City where he joined the staff of Life magazine in 1899. In the 1900 census, Richards, his French-born wife, and their daughter lived in Manhattan, New York City at 144 West 13th Street. His occupation was artist. Who’s Who said his work was exhibited at the Paris Exposition 1900. The New York Times, July 9, 1921, said he was cartoonist for the New York Herald in 1901 and 1902. In 1901 Richards was involved with two books: The Idiot at Home Three Other Farces was co-authored with John Kendrick Bangs and published by Harper Brothers; and The Royal Game of Golf, published by R.H. Russell. In the following census, he remained in Manhattan but at another address, 37 West 22nd Street, where he continued as an artist. Some of his neighbors were artists and illustrators: Frank Bittner, William Lippincott, Bertha Low, George Reevs, and Ada Budell. His wife passed away October 19, 1912, at Sellersville, Pennsylvania, according to death notices, published October 22, in the New York Herald and Philadelphia Inquirer. 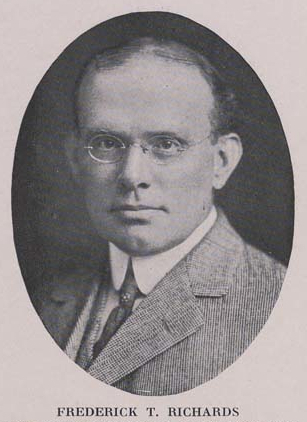 Richards was included in Empire State Notables 1914 which said he was on staff at Life since 1888 and at Collier’s Weekly, and cartooned for the New York Herald and New York Times. 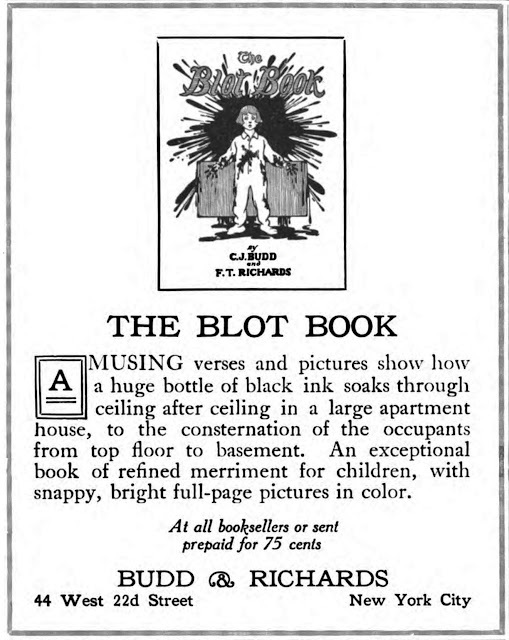 He illustrated and Charles Jay Budd wrote The Blot Book, which they published in 1915. 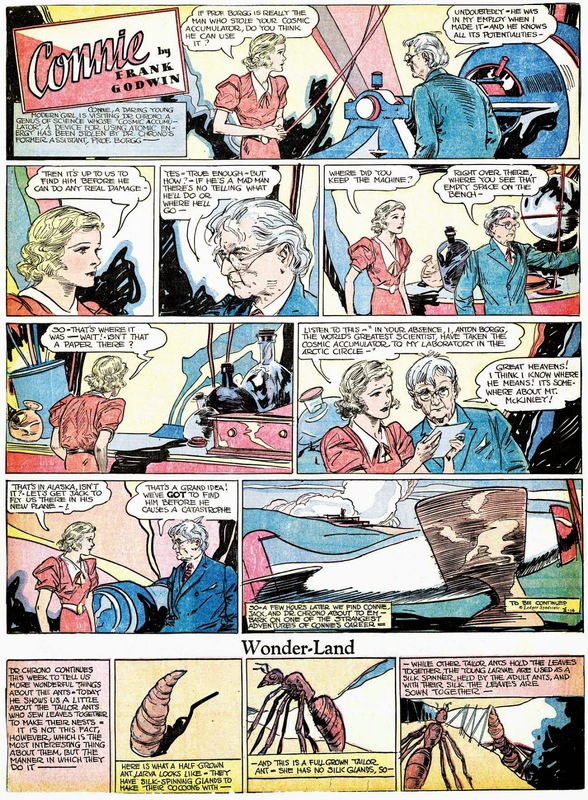 According to American Newspaper Comics (2012) Richards produced, in the late teens, News Item for the Philadelphia North American. The 1920 census said Richards was the head of the household in Philadelphia at 1815 North 22nd Street. With him was his widow sister, his nephew and his wife, and his niece with her husband and four children. He learned his profession at the Pennsylvania Academy of Fine Arts under Thomas Eakins, and at the Art Students League in New York. He belonged to the Players, Friars and Dutch Treat Clubs in New York. From the giant "to be filed" piles: a clipping from a circa 1960s English language magazine that seems to be a USSR government publication that extols the virtues of the country to Americans. This bizarre comic strip features Little Orphan Annie, Fearless Fosdick, Albert the alligator and Winnie Winkle, all discovering the wonders of Russia's permanent winter. Forty below? Book me a flight! Maybe something ... a lot ... got lost in translation. So, in other words, Ronald Reagan was just jealous of our frosty friends from Friedland. Looks like it's from the pages of the communist satirical magazine KROKIDIL. (Note thrir mascot crockidile in the last panel)That "Fearless Fosdick" looks more like Col. Bullmoose. Is there a second page to this? It seems kind of pointless. This was just an isolated page I found, already clipped out of a magazine. If there was a second page to it, the information is lost to history. The alligator character made me think it might be Krokodil, too, except that the reverse of this clip is a rather high-brow article (in English) about the museums of Leningrad. I didn't think that sort of thing was fodder for Krokodil. But maybe the highbrow magazine took this as an excerpt from Krokodil (since Commies don't care about copyrights). A hello from the Hinterlands (joe from San Diego) - I have a copy of a compilation from Krokidil - 1950's..can't lay my hands on it at the moment. I did some microfilm reading in my time.... historical research... and have found old newspapers on line now...searchable. I've been looking at the beginnings of the comic strip in various newspapers. Very interesting. And fun! more as I go forward and read thru the archives....there's a bunch.